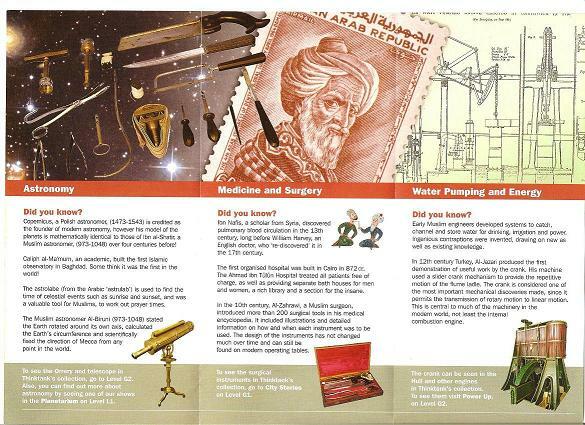 1001 Inventions: Discover the Muslim Heritage in Our World launched at Thinktank, Birmingham's Museum of Science, at Millennium Point on 24th May as part of a UK-wide tour. 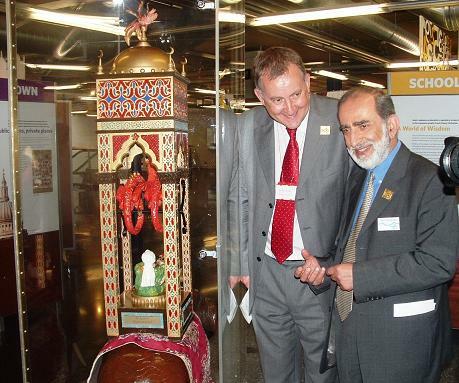 This unique travelling exhibition revealing 1,000 years of the rich scientific and technological heritage of the Muslim community, will be supported by many themed events and activities. 23 August 2007, Thursday, 6.pm. FREE. ‘Mapping the earth in the Medieval Islam'. By Professor Emilie Savage-Smith, (Oxford University). (Women only event). 25 August 2007, Saturday, 6.pm. FREE. ‘Arabic astronomy and its influence on the Renaissance'. By Dr Rim Turkmani (Royal Society Research Fellow, Imperial College). in Thinktank Planetarium. At the opening ceremony, Dr. Nick Winterbotham, Chief Executive of Thinktank, welcomed the guests who included many leading members of the Muslim Community in Birmingham. Councillor Alan Rudge, Cabinet Member for Equalities and Human Resources from Birmingham City Council followed him saying, "I view this as a great opportunity to learn more about one of our major world cultures and how it has formed part of the world we all inhabit today. This is another example of how diverse cultures and backgrounds interrelate and integrate to enrich life in Britain". Professor Salim Al-Hassani, chairman of FSTC, gave brief information about the exhibition and its background. The final speech by Dr. Zahid Parvez, Senior Lecturer, at Wolverhampton University pointed to the value of knowledge in the service of humanity and ended with an Islamic prayer for knowledge. As part of the opening activities there was an Islamic Astronomy Planetarium show and a demonstration of the ‘Patterns of Islam' workshop by Thinktank enablers. 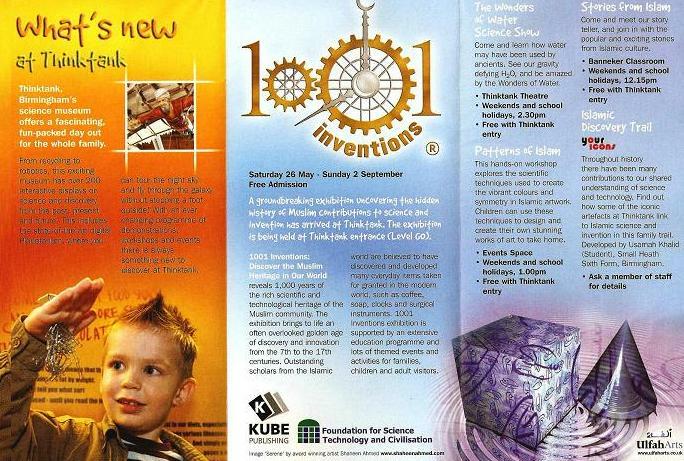 The 1001 Inventions exhibition will be staged outside the entrance to Thinktank and will be FREE to visit. The exhibition consists of various interactive and static exhibits including reproductions of inventions which were significant in each of the seven respective fields of Home, School, Market, Hospital, Town, World and Universe. This theme of seven zones of human daily life runs throughout all of the 1001 Inventions projects. 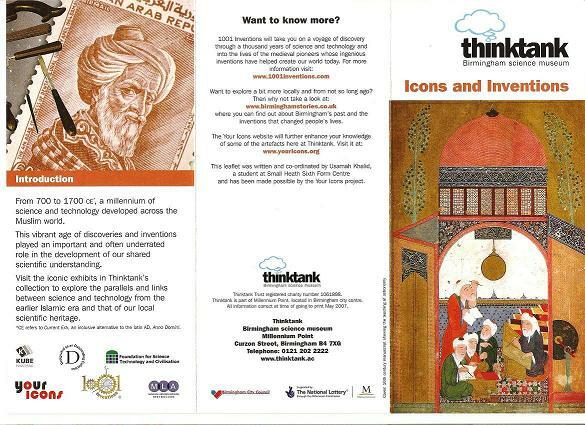 This is a ground breaking mobile exhibition based on historic inventions inspired by Islam during the Golden Age of Muslim Civilisation (600– 1600CE). 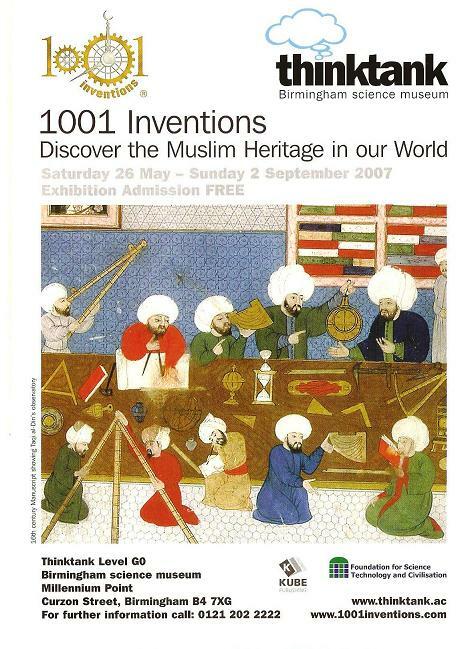 The groundbreaking 1001 Inventions exhibition uncovers the hidden history of Muslim contributions to science and invention and brings to life an often overlooked golden age of discovery and innovation from the 7th to the 17th centuries. 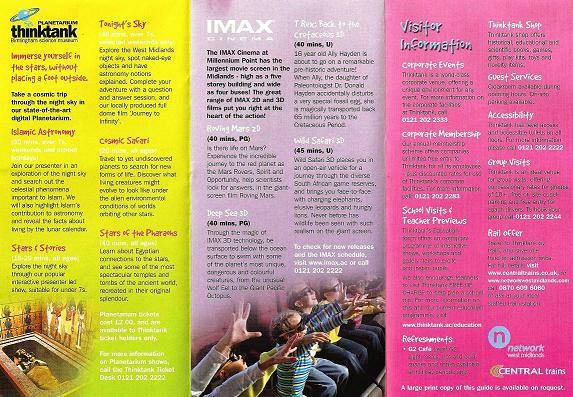 It is supported by an extensive education programme plus themed events and activities. 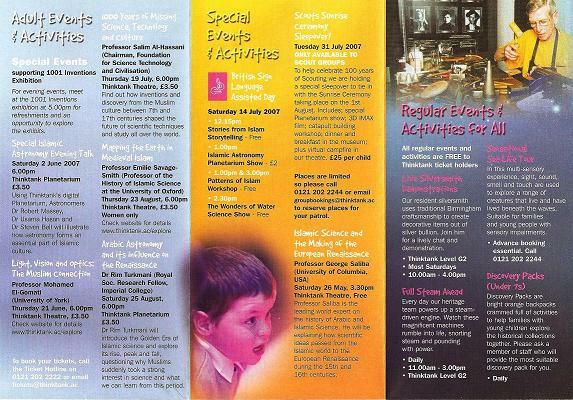 For younger visitors this includes; Patterns of Islam, a hands-on workshop exploring the scientific techniques used to create Islamic artwork; Islamic Astronomy Planetarium shows; Storytelling with popular tales from Islamic culture and an interactive ‘Wonders of Water' family science show. And for adults there is a programme of Astronomy evening talks and Topical Science events with experts in Islamic contributions to science and technology. Exhibition is FREE to visit. Supporting events and activities are only available to Thinktank ticket holders. For ticket prices and booking, visit www.thinktank.ac or call 0121 202 2222. 26 May 2007, Saturday, 3.30pm. FREE.- ‘Islamic Science and the Making of Renaissance Europe'. By George Saliba, Professor of Arabic and Islamic Science at Columbia University, USA. 2 June 2007, Saturday. 6pm, £3.50. 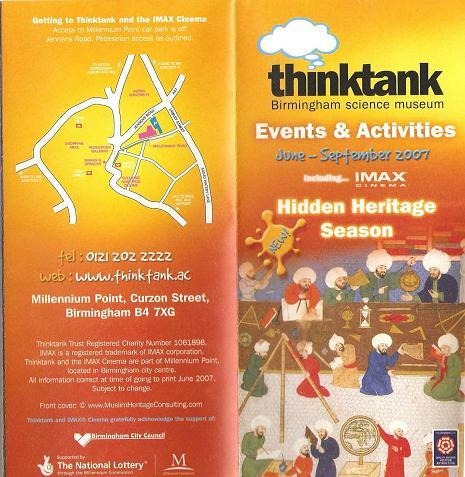 Special Islamic Astronomy evening talk, in Thinktank Planetarium. By Robert Massey - Dr. Usama Hasan and Dr. Steven Bell. 21 June 2007, Thursday, 6pm, £3.50. ‘Light, vision and optics: the Muslim connection'. By Professor Mohamed El-Gomati (University of York). 19 July 2007, Thursday, 6.pm. FREE. ‘1000 Years of Missing Science, Technology and Culture'. By Professor Salim Al-Hassani, Chairman of FSTC.